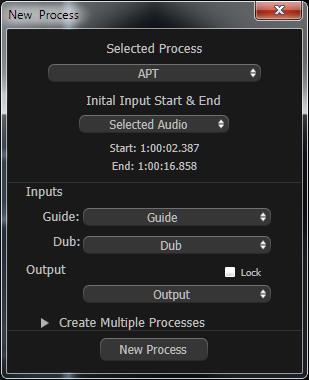 If the length of the audio is roughly equally long for the whole Guide and Dub, you can now Process the audio in Revoice Pro. Normally, this means that with the Revoice Pro window selected, press the B key to bring up the New Process window (shown right). If the settings in that window are correct, then click New Process button (or press the keyboard N key) and Revoice Pro will use the process's User Default settings to process and play the audio. See the chapters on APT and Doubler processing and auditioning for more details. If the processed audio sounds correct, it can be easily transferred back to Nuendo/Cubase.